Jeff Heck, a Massachusetts native, relocated to Sarasota County in 1998 and has been serving Sarasota as a local Firefighter / EMT since 2006. He has an Associates Degree in Fire Science from Keiser University. 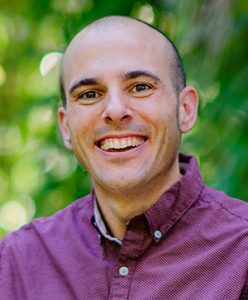 Jeff, an entrepreneur at heart, started SRQ Carpet and Tile Cleaning in 2014 with the mission of serving the community with integrity and excellence. He is IICRC Certified in Carpet, Tile and Upholstery Cleaning. Jeff truly loves what he does, from assisting people in times of crisis to getting out stubborn stains, Jeff is blessed with the opportunity to serve the community. He also enjoys golfing, fishing, surfing and running around with his three kids. Call us today and let our family serve you! 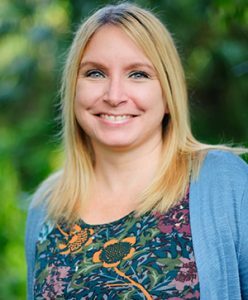 Anna Heck is a Sarasota native who is excited about bringing you a reliable and valuable service experience. 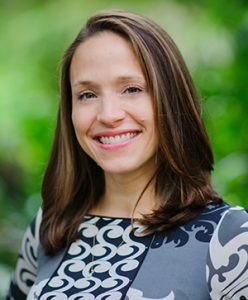 Anna is licensed and certified Physician Assistant with a Master’s degree in Physician Assistant Studies from the University of Florida’s College of Medicine and Bachelor’s degree from Smith College in Massachusetts. Anna works part time in dermatology, and part time at SRQ Carpet and Tile. Her hobbies include historic real estate, Italian culture, and spending time with her family. Anna is here to greet your call with a friendly voice, explain our services and schedule your next appointment! New to the Sarasota area, Amy comes to us from Orlando. She is a college graduate from University of Central Florida with over 20 years of premier customer service experience in the retail and service industries. Amy joined our team in 2017 and quickly became the backbone of our operations. When Amy is not here serving our customers, she can be found studying for her Master of Arts in Clinical Mental Health Counseling. Amy also enjoys going to the beach, fishing, and spending time with her son. Amy is here to greet your call with a friendly voice, explain our services and schedule your next appointment. Call us today and let us show you what genuine customer service looks like! Rashad Dawkins, a Sarasota native and proud dad of three, is also in the business of fighting fire and saving lives. 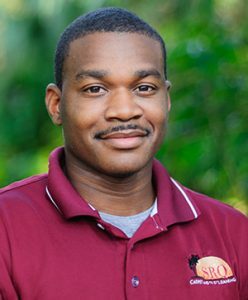 Rashad has an Associates Degree in Fire Science and Emergency Medical Services from Hillsborough Community College and has been serving our community as a Firefighter and EMT since 2006. Rashad is a tremendous asset to our service team. 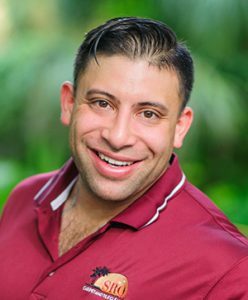 Known for being exceptionally upbeat and proactive, Rashad is dedicated to working efficiently and maximizing your cleaning results. When Rashad is not cleaning carpet or fighting fire, he enjoys riding motorcycles, being involved in his church and spending time with his family. Call us today, and get to know our extraordinary crew! 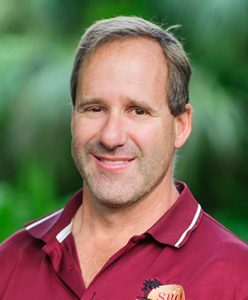 Collin Kornhaus is a Sarasota Native who serves as one of our most experienced cleaning technicians, as well as an esteemed Sarasota County Firefighter/EMT. Collin is known for his friendly demeanor and attention to detail. When he is not fighting fires or taking care of our customers he can be found playing with his adopted dog, Sawyer. Collin also enjoys fly fishing, fly tying and aerial photography. Call us today and allow our technicians to show you what dedication and hard work look like! Ronnie Fincher joined our team in 2018 and we could not be more thrilled! Ronnie, a Texas native, moved to Sarasota in 1989 and has been serving Sarasota as a local Firefighter/EMT for over 20 years. When Ronnie is not serving our customers or fighting fire, he can be seen hanging out with his wife of 22 years, his three children or playing and watching baseball. Call us today, and experience Ronnie’s care for you and your cleaning needs first-hand! Jonathan Chu, originally from Boston, moved to Sarasota with his family in 2000. As a hard working cleaning technician, Jon genuinely enjoys getting to know our customers and providing them with friendly service. 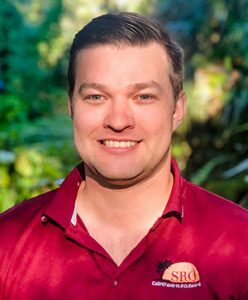 Jon also serves Sarasota as a local Firefighter/EMT. Recently engaged, he enjoys hockey, traveling, watching sports, and hanging out with his two dogs, Merle and Bagel. Call us today, and experience his genuine care for our customers and their animals! SRQ Carpet and Tile Cleaning is a thriving carpet and tile cleaning company with employees working together to fulfill individual, company and community needs; putting in place systems and procedures that ensure consistency and quality, maintaining the same level of care and compassion our customers have always known; going above and beyond to make customer cheerleaders that not only support us but trust us with their friends and families; fostering a job culture of creativity and humility- accepting constructive criticism and welcoming healthy change. God First, Family Second and Business third: Hold strong to your priorities when making personal and professional commitments. Mutual Respect: Treat customers and coworkers with the same level of consideration and warm regard as you would your own family. Communication: Utilize advanced technologies to keep customers informed and educated throughout their entire service experience. Integrity: Carry yourself with the highest level of professionalism and credibility. Always place people before profits.